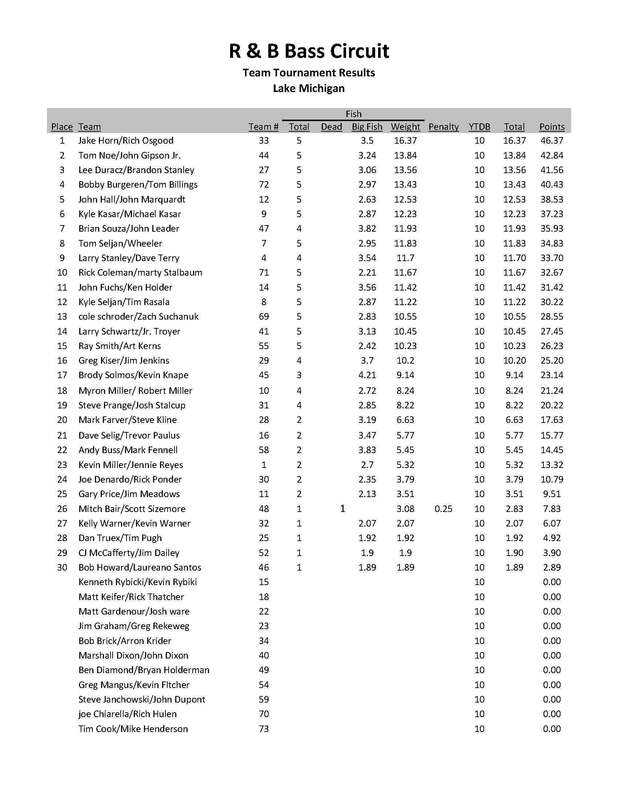 1st Place: After finishing runner up at Lake Wawasee and a victory here, Jake Horn and Rich Osgood are not only $713 richer, but also find themselves sitting on top of the Standings halfway through the season. 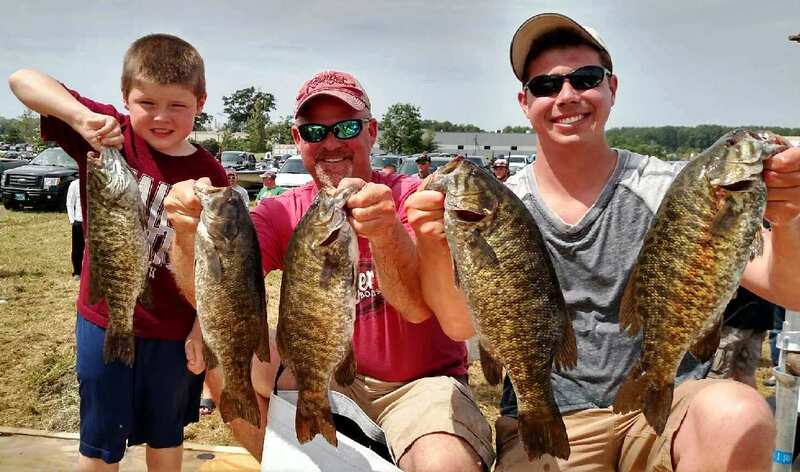 Their 16.37 pound limit secured them a victory in one of the largest bass tournaments ever held on Southern Lake Michigan. 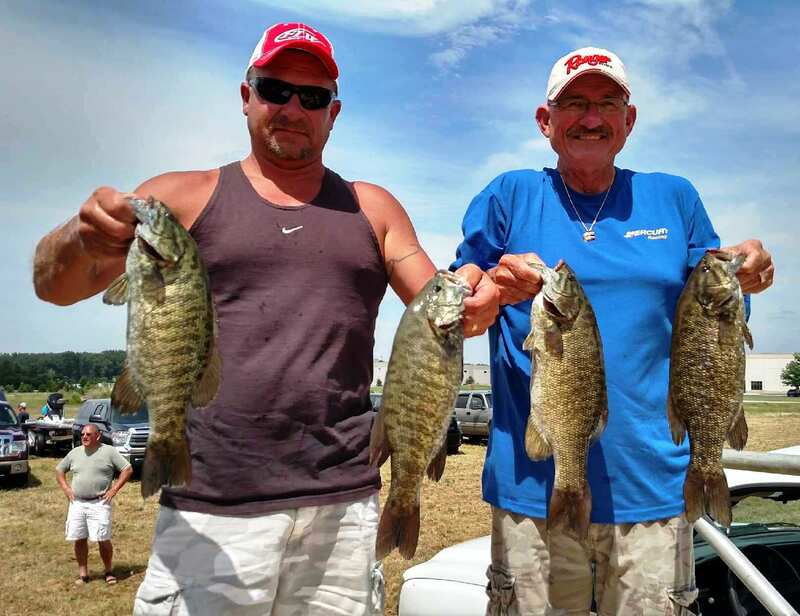 2nd Place: Despite never getting their boat on Southern Lake Michigan to practice, Tom Noe and John Gipson, Jr. still managed a 13.84 pound limit of smallmouth. But don't be fooled, they had a gameplan: "I was actually able to walk through several marinas the Thursday before and looked for bedding fish," revealed Gipson. Thus, their game plan - catch those fish, and they executed expertly. They fooled their fish with drop shot rigs and Money Mouth Baits tubes between 2-8 feet of water in seven different locations. They pocketed $432 for their efforts. 3rd Place: Angler's Choice tournament directors Lee Duracz and Brandon Stanley put together a 13.56 pound limit of smallmouth to win $324. They focused on shallow gravel found between East Chicago and Gary in water less than four feet. While they felt fish were bedding in these areas, they could not see them. Fish were caught with tubes, spinnerbaits, and lipless crankbaits. 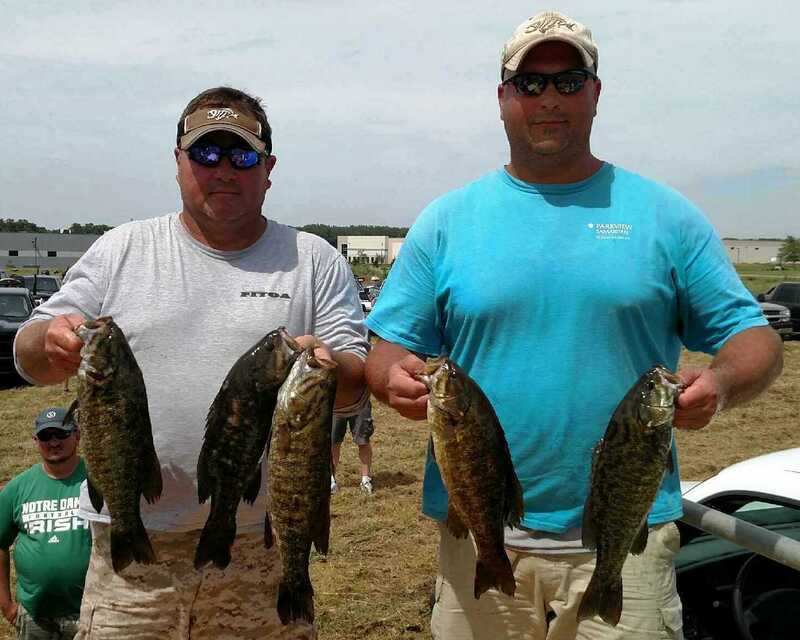 4th Place: Directors of Stray Casts, Bobby Bergren, and Tom Billings, put up with the pain of Lake Michigan to land a 13.43 pound limit and claim $216. "My back is killing me!" exclaimed Bergren three days later. The team traveled 100 miles throughout the tournament. They landed 15 keepers with a Tight Rope finesse jig in the green & gold color scheme. These jigs were complimented with a Poor Boy's Erie Darter in the Plenzler Melon color. While they could not see the fish they caught, they are convinced they were on beds. 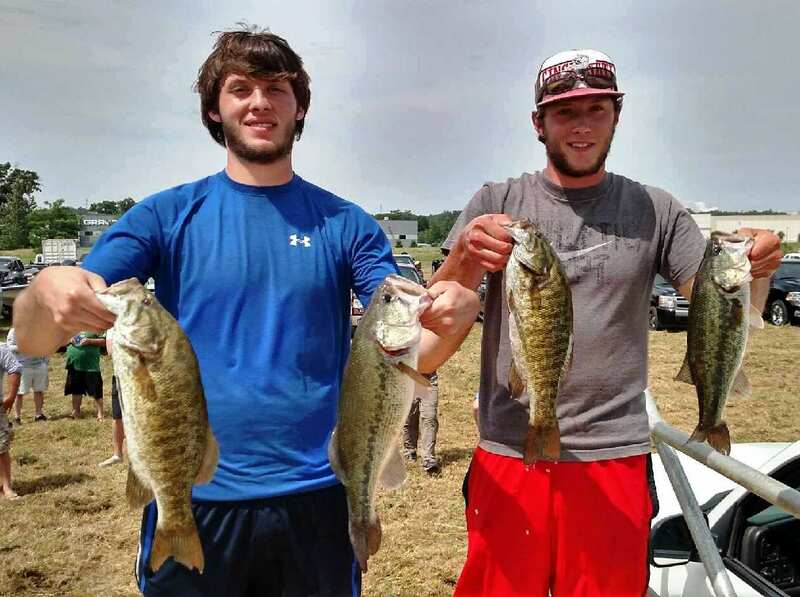 Money Mouth Baits Big Bass Award:Kevin Knape and Brody Solmos (left) landed a 4.21 pound smallmouth to claim $328. The fish was tricked by a drop shot rig armed with a Roboworm in the Aaron's Magic pattern. 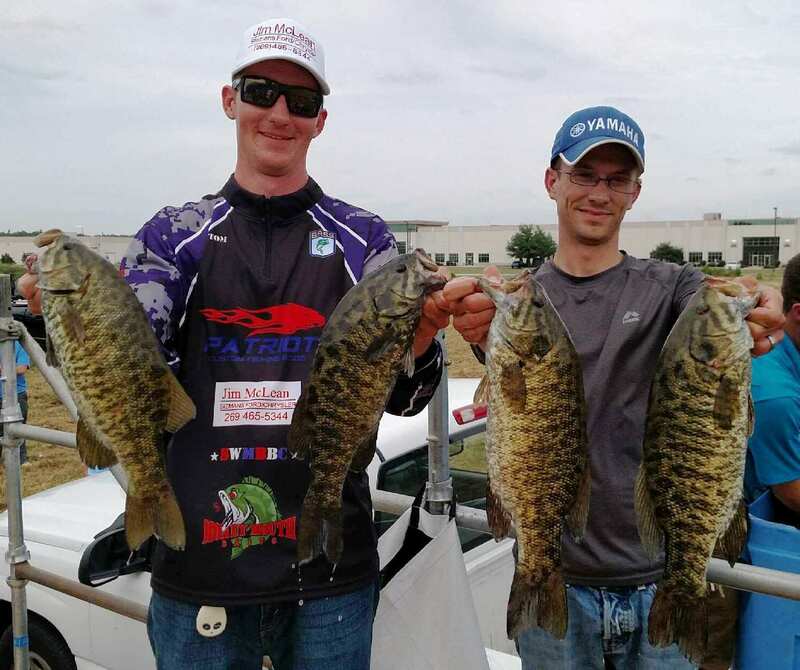 5th Place: Before the tournament, John Hall and John Marquardt had only been on Southern Lake Michigan one time, and on that day, the winds blew so hard, they were forced to stay in the harbor. Regardless, the team went on to land nearly 20 keeper smallmouth on the main lake. When the tournament began they searched out a mudline along the breakwall and disected it with homemade finesse worms. All but one fish came from a single 100 yard stretch of wall that coincided with the mudline. Solar Bat Sunglasses Incentive: Finishing in 20th place with 6.63 pounds, Mark Farver and Steve Kline qualified for the Solar Bat Incentive worth $100 in cash. Make sure you are qualified! to our starting spot, which was in Wisconsin." They still went through 12 different spots and ran nearly 80 miles. "We knew the marinas were going to get picked apart," Horn confessed, "so we targeted mainlake bedding fish." 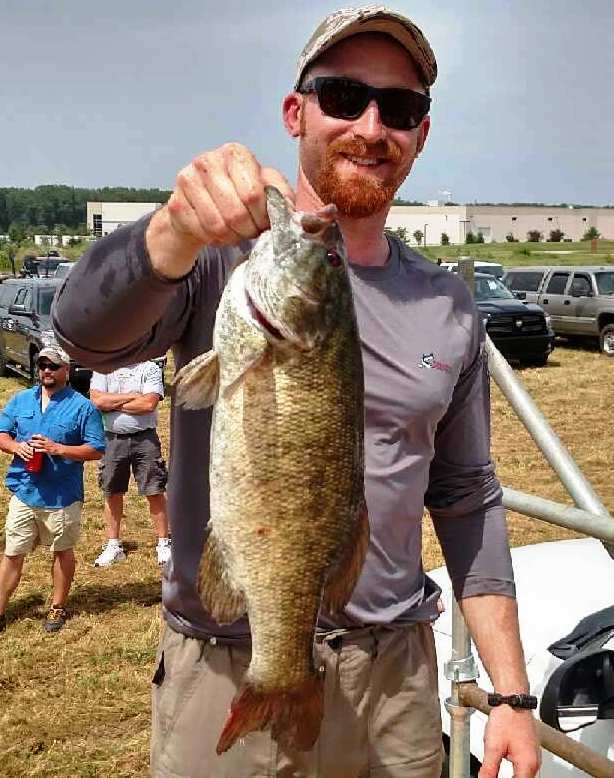 They used a drop shot rig to catch a limit in just 20 minutes and then sorted through three more limits of smallmouth. two pound plus fish by soaking the bait. Hall admits, "The key was to soak the bait. The bigger fish wanted that slow presentation." This connection scored them $151. 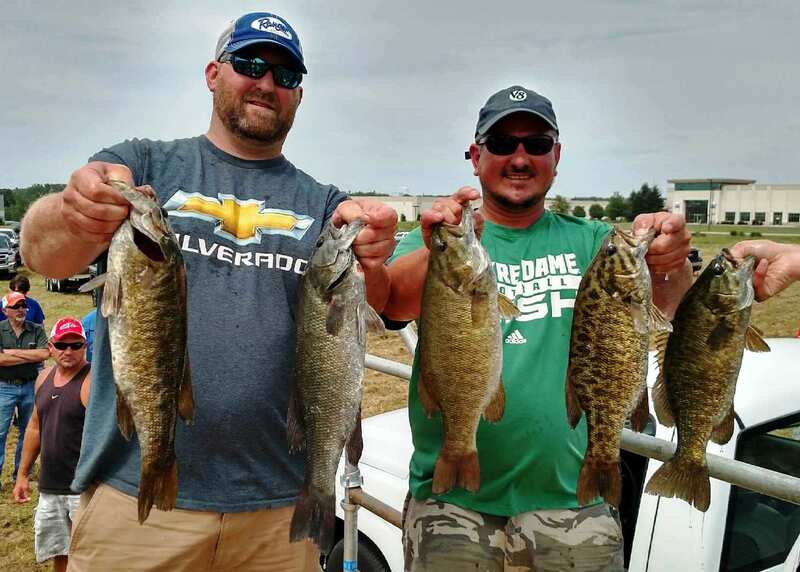 2nd Big Bass: Tournament Directors Mark Fennell and Andy Buss (right) landed a 3.83 pound smallmouth with a D's Lures tube and tube jig to claim $82. 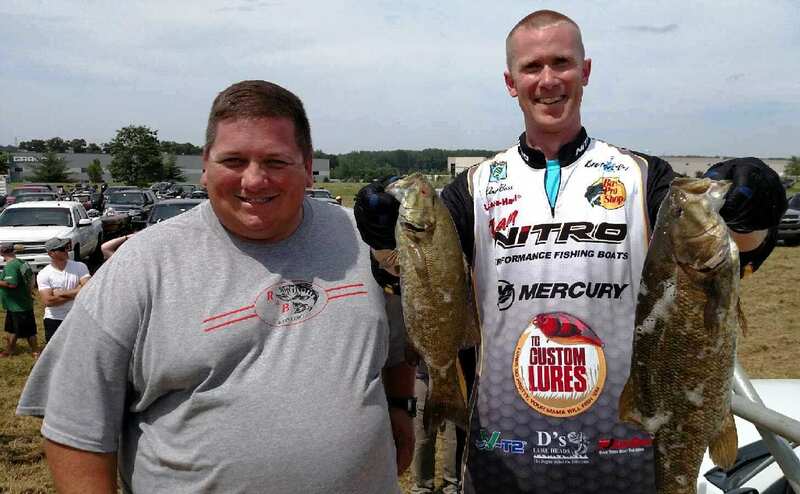 6th Place: A 12.23 pound limit scored Kyle and Michael Kasar (left) $130. 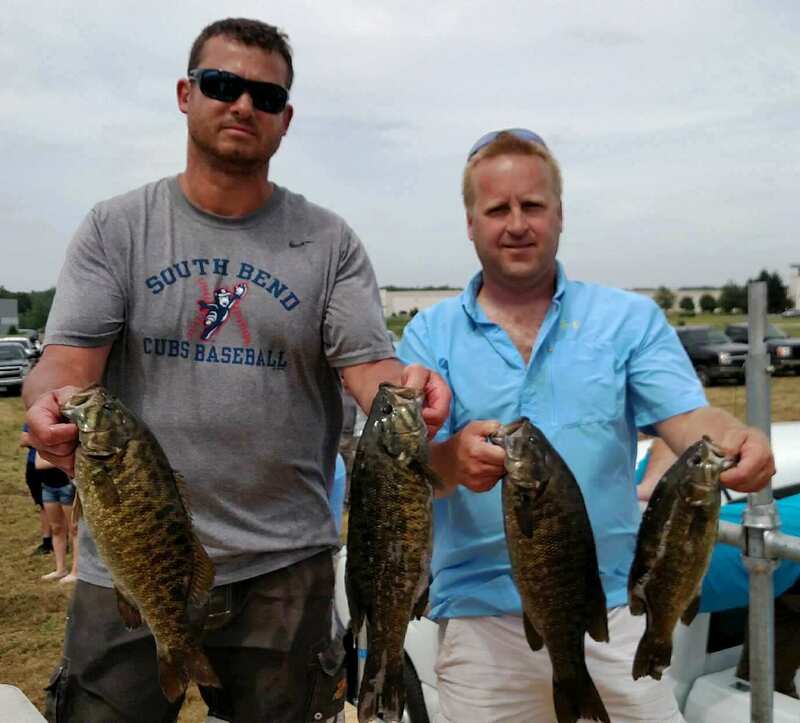 7th Place: Four fish weighing 11.93 pounds won John Leader and Brian Souza$108. 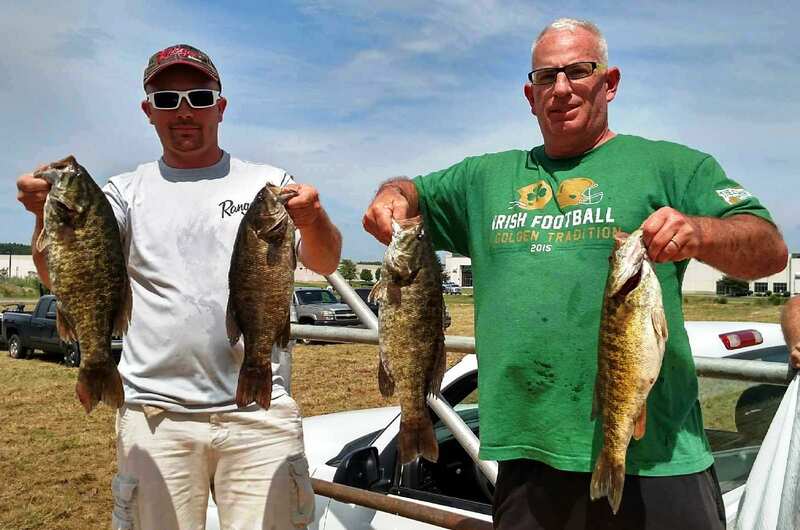 9th Place:Tom Seljan and Jim Wheeler landed 11.83 pounds of fish to claim $86. 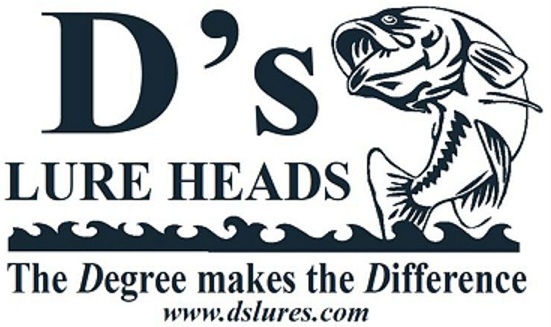 D's Lures Award: Despite constant whining by Larry Stanley about going to Lake Michigan, he and partner Dave Terry still landed 11.7 pounds of fish to claim a package worth well over $50. No more whining Larry! 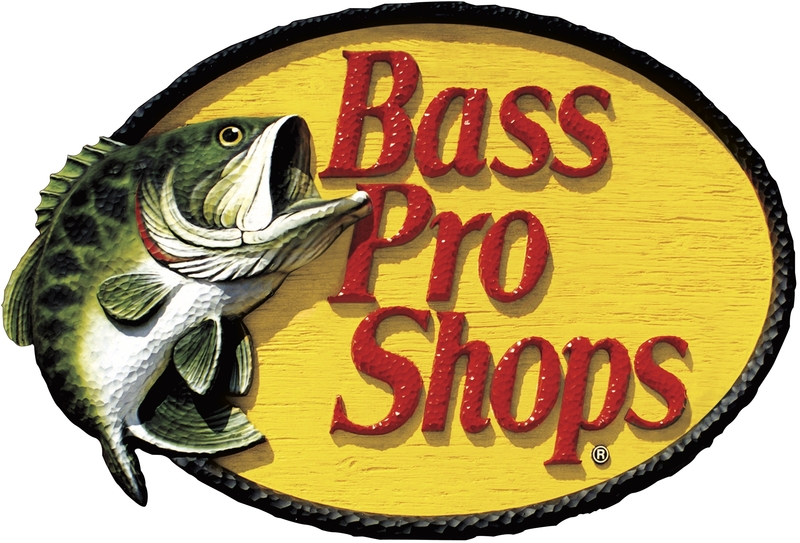 Bass Pro Shops Award: Ray Smith and Art Kearns finished 15th place with 10.23 pounds and won a Pro Qualifier reel provided by the BPS store in Portage, Indiana. On top of providing over $2,500 of product to the R & B Bass Circuit, BPS was also the site of the weigh in. 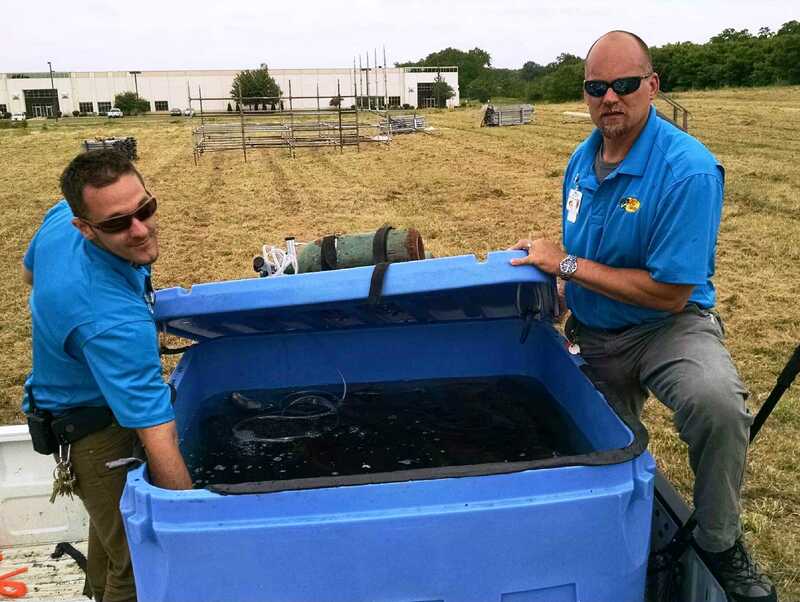 They provided a stage, holding tank, release tank, and released all 105 fish weighed. We thank Jim Osbourne and the BPS family.